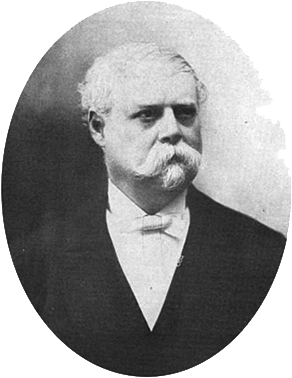 The US statistician, romance novelist and amateur engineer Charles Felton Pidgin (1844-1923) (see biography of Charles Felton Pidgin) from Boston, Mass., was a holder of quite a few patents (at least 10) for various devices, like indicator, apparatus for compiling statistic (Pidgin's system for census, the so callled "chip" system, in late 1880s was the main rival of the tabulating system of Hollerith), calculating mechanism for typewriter (pat. No. 1044597), motion picture (a very funny idea for adding word balloons to movies by having the actors blow into inflatable tubes that had the words on them), and others, between them two patents for electro-magnetic calculating machines (US284755 and US735291). 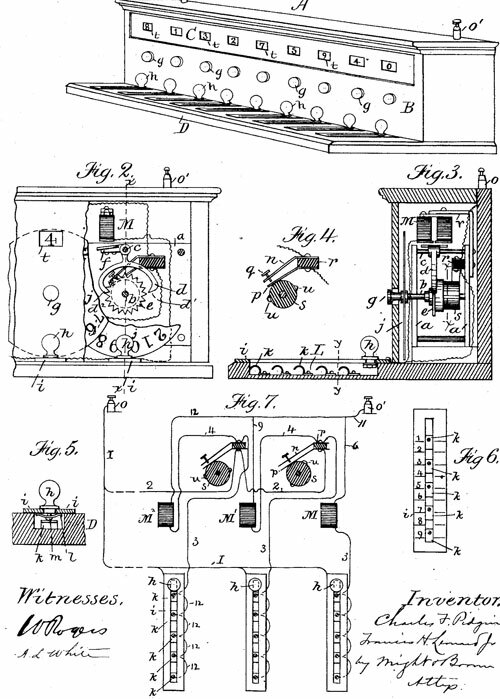 The first patent (US284755 from 11 Sep. 1883) for an electro-magnetic adding machine was granted to Charles Pidgin and Francis Leonard. It was probably the first patented electro-magnetic calculating machine in the world, before the machine of Charles Weiss from 1886. Francis Henry Leonard Jr. (1859-1908) was a Boston salesman and machinist, who also was a holder of several patents. The second patent of Pidgin was granted in 1903 and was for electro-magnetic adding machine of different type. To illustrate the mode of operation and manipulation of the machine of Pidgin, let's refer to the first patent drawing. In the operation of the machine, to indicate the number "1" on any of the indicators, the circuit-closer h of that indicator is drawn forward to make contact with the first spring, k, and the result appears by the presentation of the figure "1" at the corresponding aperture. If the indicator be the first one, the figures "1" will simply indicate unit 1; if the second, 10; if the third, 100; the fourth, 1000, and so on. When the circuit-closer h is drawn forward to make contact with the first spring, k, the battery-circuit is closed through battery post or screw 0, wire I, plate i, spring l, and screw m of circuit-closer h, contact-spring k, (and supposing we are operating the unit-slide,) wire 3, magnet-coil M, wire 6, common return-wire 11, and terminal o', thence to the other battery-pole or ground wire. The electromagnet M is thus vitalized and attracts the armature-arm f, causing the escapement to rotate the ratchet-wheel e one space, the dial j of course rotating with it and showing the figure "1" at the opening t of the casing. Every time the circuit-closer h touches a spring, k, an electrical impulse is sent through the electromagnet and the dial j advances, as described. To further illustrate the manipulation, let's refer to Fig. 6. We have already described how one number is indicated on the dial j. Let it be supposed that we wish to add 29 to 33, the operation is as follows: To add 29 to 33, the unit-dial indicating "3" and the tens-dial indicating "3", to add the "9" to the three units, pull the unit-key down to the point numbered 9 and push it back, making the contacts going down and four going back. The unit-dial will then indicate "2" and on the tens-dial "1"; ten will be carried to the "3", changing it to four tens. To add the two tens, pull the tens-key to 2 and return, making one contact going and one returning. The tens-dial will then indicate "6" and the units-dial "2", reading from left to right "62", which is the sum of the two numbers 33 and 29. The machine will of course always show the sum of all numbers registered subsequent to the time it was last set at zero; and any number may be registered from 1 to 990000000, the simple registering of an additional number or numbers immediately changing the reading on the dials to the sum of the number previously registered and the amount added by the last operation. The machine has an automatic electric carrying device, whereby the figures of one arithmetical denomination are automatically carried to the next, if tens carry should be done.